Spend a lovely spring day learning about the history of our country by walking the Freedom Trail. The brick-lined trail will lead you to 16 of Boston’s most significant historic sites including Paul Revere’s house, the Bunker Hill Monument, the Massachusetts State House, King’s Chapel, the Old South Meeting House and much more. Take the walk with costumed guides or enjoy it at your own pace on a self-guided tour. Explore the city’s most important and interesting sights on-board the orange and green trolley. Old Town Trolley offers a comprehensive sightseeing experience, transporting you to more than 100 points of interest. See historic sites like Faneuil Hall, the Old State House, the Old North Church, the Boston Massacre Site, and more. The fully narrated Boston tour is led by an experienced guide who will not only fill you in on all the fascinating facts about the places you’re seeing, but will also entertain you with amusing stories. Get on and off as often and for as long as you wish throughout the tour or even spread it out over two days – the Old Town Trolley is flexible and allows you to see the best of the city in a way that suits your pace. A warm spring morning, afternoon or evening is the perfect time to enjoy a cruise in the Boston Harbor. There are a variety of cruises to choose from including sunset, lighthouse, whale watching and more. You’ll see many Boston sights, learn about the city’s history and relax as the boat leisurely sails along the water. Looking for somewhere to celebrate Mother’s Day? Stop by the Duckling Day Parade at the Boston Public Garden, hosted annually by the Friends of the Public Garden. Enjoy family entertainment, live music by the Harvard University Marching Band, a dramatic reading of Robert McCloskey’s classic children’s book “Make Way For Ducklings” and more. Springtime is one of the best times to visit the Arboretum located at Harvard University. You’ll not only be treated to a brilliant display of colorful flowers and plants, you’ll also have the opportunity to spot some of the magnificent birds and other wildlife that emerge this time of year. From magnolias to lilacs, you’ll be dazzled by the natural beauty that surrounds you. When the weather gets warm, it’s time for a visit to Boston’s Frog Pond, located in Boston Common. The Frog Pond carousel opens up in April and is a whimsical experience for kids and adults of all ages. After, sip a cool drink or enjoy a snack at the Frog Pond Café. Be sure to take a stroll through Boston Common and check out all the sights and scenery in this historic park. The Boston Marathon is the world’s oldest annual marathon. This popular sporting event attracts approximately 500,000 spectators of all ages each year. The marathon is always held on Patriot’s Day, the third Monday of April. Be sure to stop by the marathon if you’re visiting Boston in spring. ArtWeek in Boston features painting, dancing, public art, live music and much more. With more than 60 events to choose from, visitors can enjoy a variety of unique and creative experiences. Full of interactive shows and artistic displays, ArtWeek is the perfect spring excursion for tourists and locals alike. The big St. Patrick’s Day Parade in South Boston takes center stage on the Sunday closest to March 17th, attracting up to one million spectators celebrating Boston’s Irish heritage. Festivities begin at W. Broadway and Dorchester Avenue. You’ll enjoy colorful floats, Irish pipe and drum bands and enthusiastic crowds. Be sure to wear green! During mid-April, the Boston International Film Festival celebrates the art of film-making and honors those filmmakers who make it all possible. The festival shows 100 short and feature-length films from all over the globe at AMC Loews, the Paramount and BPE Studio. The festival kicks off with an optional black-tie gala the first night. Boston Design Week features over 80 events in nine neighborhoods throughout Boston and nine towns in Greater Boston, spanning 11 days in early April. Join the 10,000 participants as design week covers architecture, urban design, environmental and landscape design, photography, fashion, interior design, graphic design and industrial design. Kick off the paddling season in late April with the Run of the Charles: Boston’s Premier Paddling Race. This is the largest race of its kind in New England and a big event in Greater Boston, averaging 1,500 racers and thousands of spectators each year. It offers a variety of canoe, kayak and paddleboard races for all skill levels. After the race, join the festivities with food, music and prizes! 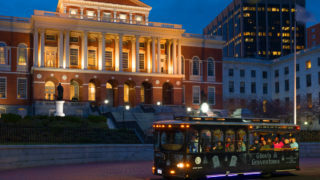 Explore Boston’s darker side aboard the city’s only “frightseeing” ghost tour. Prepare yourself for an evening of fun, scares, and ghost stories guided by a 17th century gravedigger. You’ll visit the streets where the Boston Strangler once prowled and hear local tales of murder and mayhem, ghosts and ghouls. Admire the rich and unusual plants, the Lagoon, the monuments and fountains, and the Swan Boats created and operated for over 100 years by the Paget family. Boston Parks and Recreation Department grows all the plants used in bedding-out the Public Garden in their greenhouses. Over 80 species of plants are cultivated there for future plantings in the Garden and more than 50 other locations around the city. Due to the wide variety of plants and its romantic setting, the Garden attracts many weddings. The regular season for both teams ends in mid-April. Although both teams are known for making it to the postseason on a regular basis, it’s great to catch them before expensive playoff tickets hit the market. Old State House Museum – Built in 1713 on the site of the first Town House, is the oldest surviving public building in Boston. Boston Harbor Cruise (45 Minutes) – Cruise along Boston’s Inner and Outer Harbor and see Historic Landmarks. *Applies to standard ticket. Offer valid April – October, 2018. Boston Harbor Cruise is available to purchase at ticket booths only. Ticket must be purchased by October 31, 2018. Ticket is non-transferable. Other restrictions may apply. Extra days or free portion of the ticket has no cash value and is not refundable and non-transferable.